Orange Marmalade. Put the oranges in salt and water for three days, change the water every day. 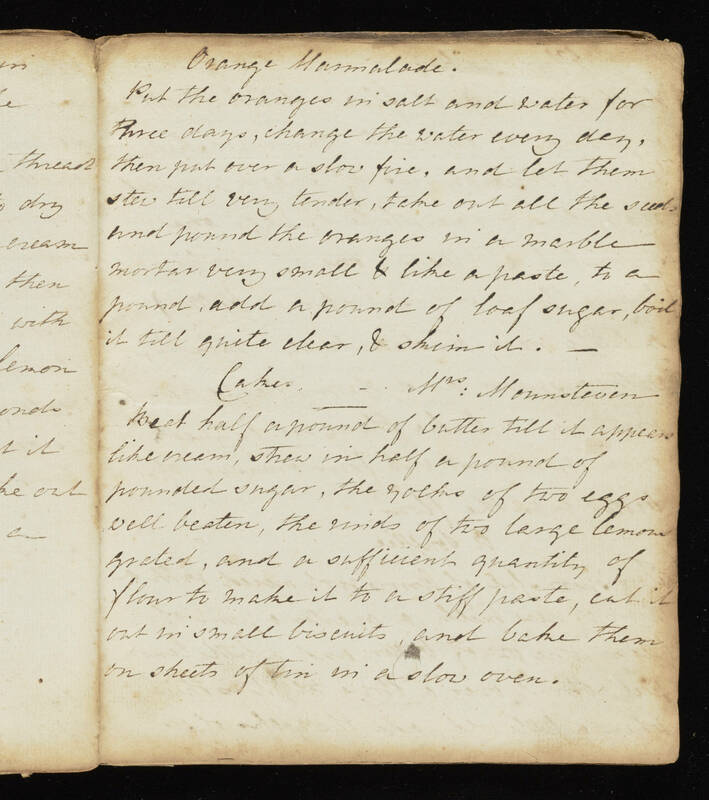 Then put over a slow fire, and let them [illegible] till very tender, take out all the seeds and pound the oranges in a marble mortar very small & like a paste, to a pound, add a pound of loaf sugar, boil it till quite clear, & skim it. Cakes - Mrs. [illegible] Beat half a pound of butter till it appears like cream, [illegible] in half a pound of powdered sugar, the yolks of two eggs well beaten, the rinds of two large lemons grated, and a sufficient quantity of flour to make it to a stiff paste, cut it out in small biscuits, and bake them on sheets of tin in a slow oven.